The original filth-encrusted and catacomb dwelling approach to death/doom, best exemplified by bands such as debut era Sentenced, Asphyx, Mental Funeral era Autopsy, Winter, earlier Cianide, and so on is an interesting example of a style that while revered and respected is not very common nowadays. It’s not hard to rattle off the names of bands like Anatomia, Spectral Voice, Cavurn, Uttertomb, Krypts, and Swallowed. However most of these are fairly recent and unfortunately like a lot of things associated with doom metal, quite a bit of dragging, plodding, and general aimlessness holds back more than a few of these bands and their associated acts. Digging its way out of the burial grounds of Lisbon creeps the festering menace of Archaic Tomb with their debut demo, Congregations for Ancient Rituals. Armed with the steady drilling technique of the classics but spirited in a way not often native to this subgenre, these Portuguese corpse-eaters are a reminder that death/doom was about more than reverb-drenched held chord progressions and overly long thud-fests. While its strength is inherently tied to its slow tempos, it was always its underlying death metal mindset that allowed it to take the now practically fossilized sound of doom metal and rework it for far more nefarious ends. Archaic Tomb’s particular take on doominess initially isn’t as obvious as the previously mentioned bands, being a bit more implicit, subtle even, but far from being background material. Hypnotic riffs buzz and churn, fractured with powerful hammerblow chords that pseudo-resolve them on dissonant intervals. Like a death metal band they use a mixture of staggering wrist action and layered tremolo riffing, frequently implementing eerie un-melodic harmonies. However like a doom metal band their songwriting focuses less on self-fragmenting details and angular riff geometry, using broad strokes of simple but incredibly dense riffing in cyclic arrangements. In building up momentum in repetition, they then break through layers of dense ambience, gradually introducing a wider range of chord shapes and tempos. This gradual transformation of the primal and simplistic into the spiralling and intricate ends up becoming how they create atmosphere, taking a particular melody or riff to start off a song and gradually dissecting it from multiple angles, letting it self-mutate with a surprising fluidity and grace through multiple varied formations and deformations. While the songs are fairly long with three of them in the seven minute range and its shortest at five, they don’t drag due to their ability to pull off deft changes of tempo and varying the focus of a song, from arching patterns of tremolo riffing right into frenzied lead-overlaid patterns over quick bursts of blast beats. When it does slow down and go for unadulterated doom, they never fully indulge themselves, refusing to drag out into semi funeral doom territory and keeping it focused on that implicit sense of motion. While they lean more on a tremolo heavy approach to that comparable to the both praised and derided “cavern” death movement, none of their tremolo portions are stretched out too much. However they don’t let their rhythmic patterns become too complacent, ending them with the thunderous death-knell attack of crunchier chords, ensuing that even though the sense of heavy, sweltering fog remains it never simply becomes a pure sonic wallpaper. Even the harmonies are used to a similar effect, creating a sense of creeping unease underneath semi-melodic riffing. This makes Archaic Tomb very riffy for a death/doom band, almost to the level of thrashier death metal at points and surprisingly jam packed with content as opposed to the bleakly sparse sound often associated with this style. Drumming is not particularly complex but emphasizes heavily cadenced tom rolls, adding a heavy ritualistic flair that suits the ever-descending atmosphere enforced by the structuring. The vocal performance is a distant and hollow growl, bone dry in its tone. It’s almost not quite like even a real voice due to the reverb and being slightly below the rest of the instruments; a funereal echo of some lurking, hateful spirit screaming often disconnected from the main thrust of their rhythms. Some might find it not quite heavy enough but even then, I would say its heaviness is less immediate and crushing, rather not just a sense of dread but an awareness of immediate and swarming damnation, leading one deeper into a pit of shapeless, ethereal presences. In this it achieves a rare mixture of ritualism and hard hitting riffing, almost reminiscent of Grave Miasma circa 2009’s Exalted Emanation EP but with a much more energetic approach and lacking the post-Demoncy black metal influence that defined those brits. While not “new” in the sense of pure novelty technique or stylistic juxtaposition, it is more importantly very distinct in how it evokes the idea of death/doom and moreso for just how well realized it is for an EP. There is not really much I can think of to improve on here; they could extend the doom portions slightly, further explore the harmonies, utilize a more diverse set of drum rolls and fills but these are fairly general. 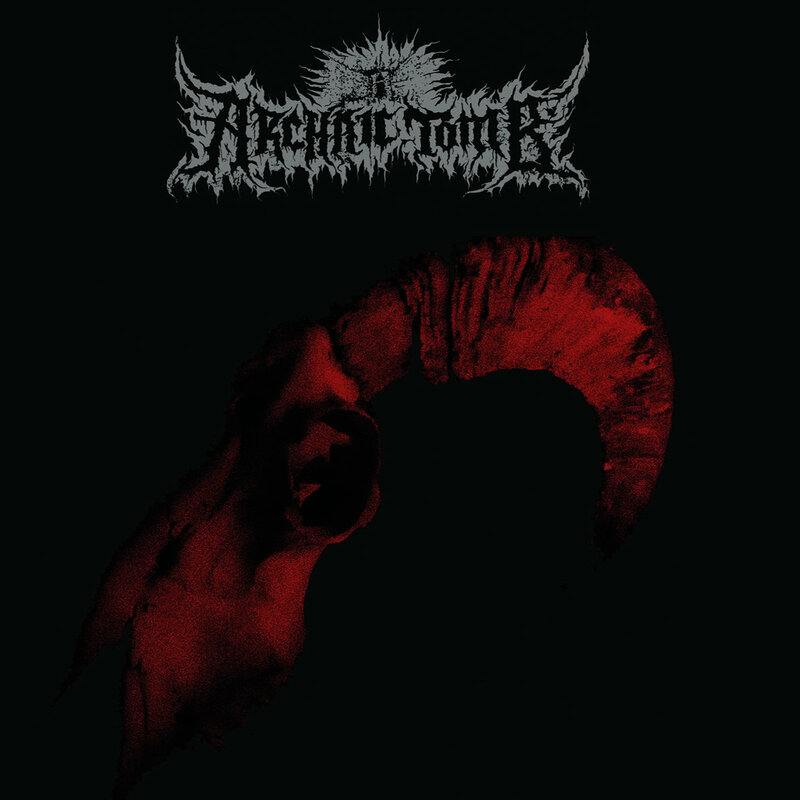 With just a little under half an hour’s worth of material, Archaic Tomb have quickly become one of the most promising new names in death metal and demonstrated a creativity in how to take recognizable ideas and reinterpret them in such a fashion that continues the original spirit and intent but in such a manner that is distinctly rooted in the mindset of today’s best and brightest metal craftspeople. Recommended for fans of bands such as Cruciamentum, Vacivus, Dead Congregation, Question (Mexico), Lantern, Phrenelith, Tomb Mold, and Void Eater. This entry was posted in Death Metal, Featured Review, Reviews and tagged 2018, Anatomia, Archaic Tomb, Asphyx, Autopsy, Calligari Records, Cavurn, Cianide, Cruciamentum, Dead Congregation, Death Metal, Demoncy, Disembowelment, featured, Grave Miasma, Incantation, Krypts, Lantern, Phrenelith, portugal, Question (Mexico), Sentenced, Spectral Voice, Swallowed, Tomb Mold, Uttertomb, Vacivus, Void Eater, Winter.